This is one of my favorite food trucks in DC. The dosas are delicious and a must try!! The sauces that come with the meal are also really great. Large portions, extremely friendly service. I'm not sure if they have a weekly schedule, but when I see they are down in Franklin Square I always try to go. I had the daily special, not sure what it was called but it was a large amount of food for the money and was just right as far as spicyness goes (I asked for medium). It had two entrees (one was chickpeas and potatoes, the other was peas/lentils with some sort of patties), rice, soup, some sort of dessert cake, and naan. It was very good. The only negative is that the pulp-based food trays they use weren't quite up to the challenge. Tasty Indian food. This is one of the best food trucks in Washington D.C. Must try. This truck is all vegetarian, which is great. I had the special which was lentil and potato curry, rice, a biriyani and naan. Rice was a little unevenly cooked, but had great flavor and lots of added vegetables. The biriyani was incredible, and the curry was decent, although the sauce became a little one note. It was a ton of food, and I couldn't finish. Would try this truck again. Amazingly, the Punjab Curry Truck which doesn't tweet had a long line, while this one didn't. Too bad, it was good. Just fabulous! Spicy but not too spicy and the portions are more than ample. Fast and friendly service. Can't wait for them to come back to Dupont again! Really delicious. They were running a Thali special that came with two curries, rice, an idli with sambar and roti. The curries (potato and a spicy curry - can't remember the name) were incredible. My new favorite. The flavors are magnificant! I could gladly eat this everyday. The flavors/spices are perfectly balanced and delicious. I feel like I am eatinig a dosa made just for me. As a vegetarian, I was glad to see this truck added to the roster, and the food has kept me coming back. The dosas are filling and tasty -- not the best-best I've ever had but very good. But what insspired me to finally write a review was today's special, a tomato soup with lentil dumplings. It was a raw, nasty day and the soup was just the thing: spicy broth with big chunks of tomato and onion, and big dumplings that both beautifully soaked up the broth and maintained a nice firm texture. I feel better already. The dosa, chutney, and sambar was AWFUL. You could still taste the urad dal in the dosa because it wasn't ground enough, and the batter did not have enough salt. The chutney tasted old and not fresh, and the sambar was dismal and barely any decent flavor. This certainly was NOT an authentic dosa meal, stay away! Also the chai was so spicy and inedible because they put too much tea masala in it. When I asked for more milk to dilute it, they said they didn't have any. Don't you taste your own items before serving them to your customers. Horrible!! I ordered the samosa chat. For $6, I got two samosas and a good amount of chat. Very tasty, not spicy. Personally, I would perfer it to be spicier, but that wont stop me from coming back. 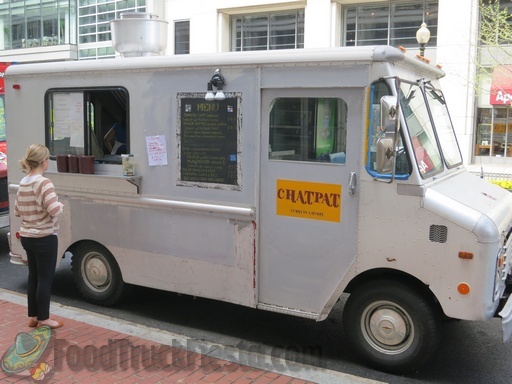 Chatpat truck serves Indian cuisine in the District.